We knew we were camped in an area animals might walk through last night. 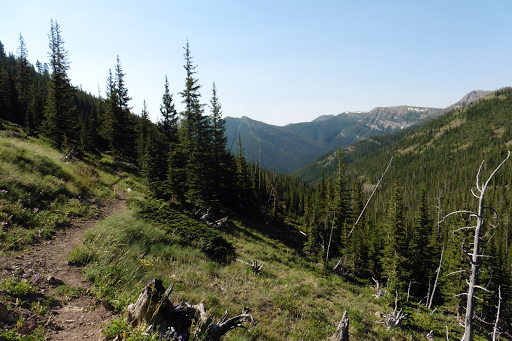 Heck, most all this deep wilderness looks like prime bear, deer, and elk territory. 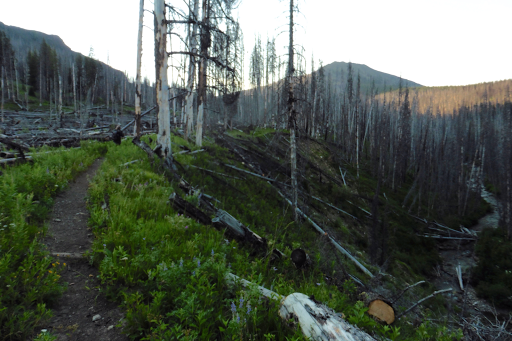 It was our closeness to a creek and fire ring that made it seem inevitable…we are already on our toes with the eating away from camp, hanging our food, and peeing a good distance from our tents. At midnight, I was startled out of a deep sleep when it seemed that something had hit me on the head. I shot up and my heart was racing…I could hear something significant moving in the grass. My storm doors were open and I turned on my headlamp to see a large deer staring back at me just one yard from my tent. It was not one bit startled and I was relieved since my mind obviously went to bear mode. It eventually ran off. I don’t know if it really nudged my tent or if it tripped a guy line or if it was my imagination, but I’m sure this won’t be the last time in the next two months that I have an occurrence like that. When we packed up this morning, we were happily surprised to find that we had no condensation at all. Perplexing considering that we camped down low, in tall grass, next to a creek…but we’ll take it! E said she also got a deer visit in the night. We started hiking at 6:30am and officially turned off the CDT. We took a side trail for almost 13mi that went over Teton Pass and then along the West Fork of the Teton River to the trailhead where the car was parked. 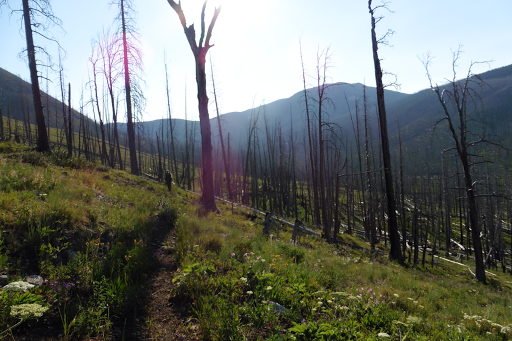 It was all burn area for the 7mi up to the pass. 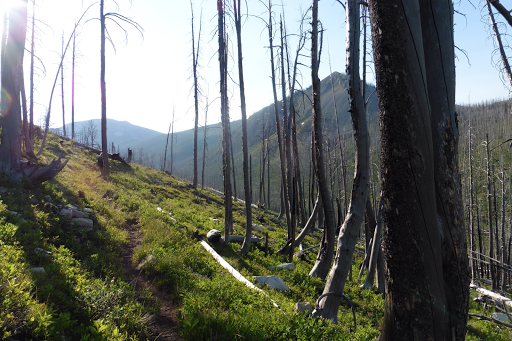 I’ve always been fascinated by the burn areas I’ve hiked through and there was a lot the last few days. We got up to the top of Teton Pass and the burn came to an abrupt end. 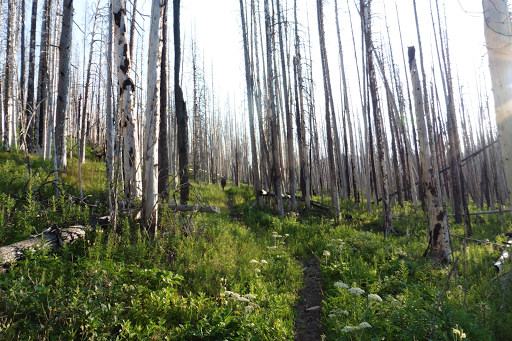 We had 2mi of non-burned forest hiking and it was such a stark contrast to what we’d been in the last 24hrs! It felt like my senses were overloaded with all the smells and colors. It was beautiful and we both loved it. It made me sad though to think of what the Bob used to look like before all these burns. It was really grand. 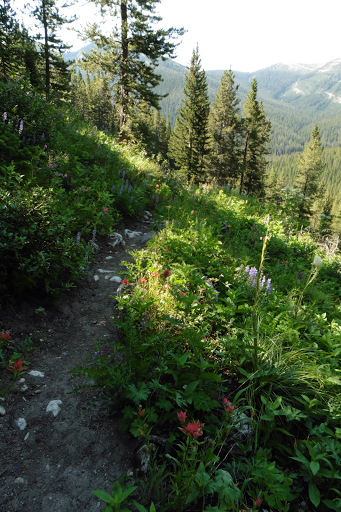 I tried to get the wildflowers to show the way the blue, purple, red, and yellow pop out of the green was just magic! After those two miles, it was back to burn for a few miles to the car. Mission “Shakedown Hike” was a success! We were happy to get this time together to get the hang of one another and our routines. It’s been a very comfortable transition and we are really excited to get on the GDT! We drove out and got our resupply boxes that were at Mark and Annie’s. We finished a half day early and weren’t expecting to be in town tonight, so we decided not to cross into Canada yet so we could make phone calls tonight in the U.S. The closest town is a tiny town called Babb. Since this early finish wasn’t planned, we were in agreement that we would camp out tonight at a site in town and eat out extra trail food for dinner…then as we drove a couple hours, the idea of a motel became more enticing…we went ahead and got a room in Babb. I was feeling a bit guilty internally since this expenditure wasn’t in the plan, but then the dark clouds gathered and thunder rolled. Temps dropped, the wind kicked up, and it’s been raining much of the evening and now it is coming down in sheets and the electricity has even gone out! We made the right choice! It is the Fourth, but doesn’t feel like it. No fireworks tonight. 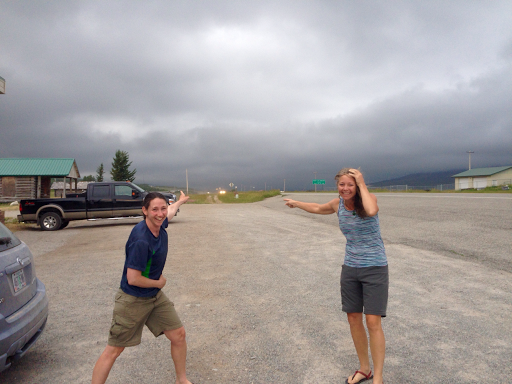 Tomorrow is the big day…we drive into Canada and technically start the Great Divide Trail! I’ll explain more in tomorrow’s post. Excited! A side story I want to share about today. Some of you may recall Cherry Picker, who I overlapped with on the PCT and CDT. The dude seems to show up randomly everywhere! This morning, E and I were reminiscing on how and when we’d each independently overlapped with him on the CDT in 2013. When I got off the trail, I had a blank phone message randomly from him that might have been an accidental dial. Really random since we rarely contact one another and I was just talking about him hours earlier. Then, tonight E and I were in front of the motel using our alcohol stoves to make dinner and a couple walked up. They commented about our stoves and saw my trail stickers I keep on mine. 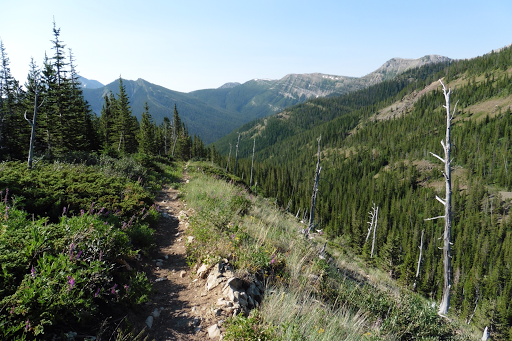 They mentioned that they had a friend that hiked the trails and asked if we knew…guess who! ?…CHERRY PICKER! Turns out the woman lives in the same house as him…and today just happens to be Cherry Picker’s birthday. All just crazy coincidences. It seems that the universe is in his favor today, so I hope he had a great birthday! So, from my warm, dry, hotel room, I wish everyone goodnight.